A few months ago I learned about Quan Viet in Braybrook thanks again to Lauren from Footscray Food Blog. 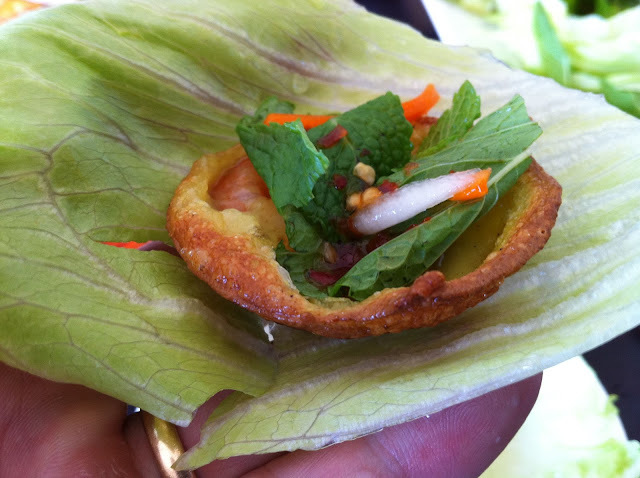 Aside from Lauren's glowing review, my interest was particularly piqued by their Banh Khot. I was obsessed with with dish ever since we returned from Hoi An in Vietnam where I had tried it at a little hawker stall in the Old Town district. One of the great things about travelling overseas is of course all the wonderful new food that you get to try, however I also really enjoy the challenge of seeking to find those same meals locally when I get back home. Banh Khot was one of those dishes and I had spent hours trying to find either a local restaurant that made them or even better a recipe that I could use to try and make them myself. For a long time I really struggled to find anything other than a passing reference and certainly nothing substantial enough to get excited about. I got a small breakthough when chatting with the Vietnamese barrista at my local morning coffee haunt. 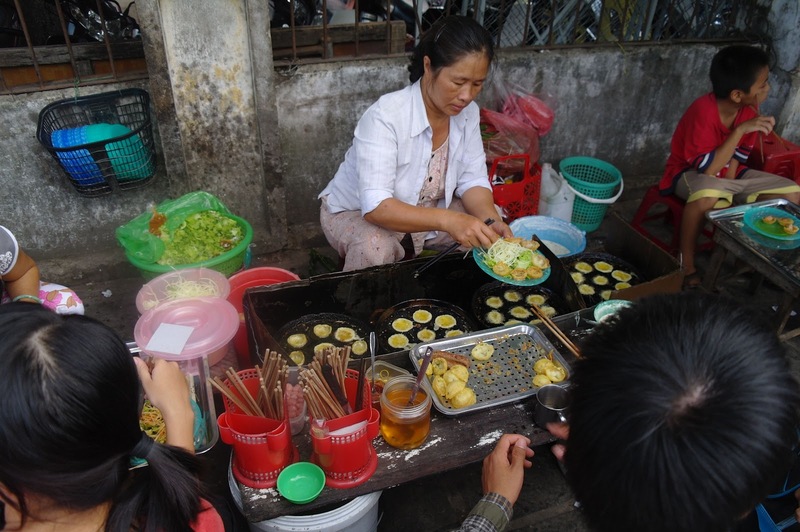 You see I had been looking for Banh Can (Nem Cha) which was how the dish was advertised on the vendor's sign in Hoi An. You can image that it was quite diffuclt as google kept replacing Banh Can with Banh Canh which is an entirely different dish of crab soup! This is a photo I took at the time and you can see some better photos, one that shows the sign with banh can nem cha and a few other better close up shots here, here and here. The dish is very similar to banh khot however in this version pork sausage is used hence the nem cha which roughly translates to grilled pork sausage. They were so delicious I couldn't get them out of mind! Closure was desperately needed! So I showed the picture to my barista who immediately recognised them as Banh Khot and gave me a whole new line of inquiry to follow up. I got my first lead via Almost Always Ravenous which directed me to Than Ha 2 in Richmond. I was over there in a flash and in quick time had scoffed down two plates (just to be sure) as well as a few other great Thanh Ha 2 offerings. They left me satisfied in that I had at least been able to scratch the itch that had been nagging at me for so long but I also felt that they weren't quite right, somehow they were a bit biscuity and not quite crispy and light like I remembered them. I had also purchased a Banh Kan/Khot pan from a grocer in Hoi An which after my visit to Thanh Ha 2 I was inspired to dig out of the cupboard and see if I could get any closer to the Banh Can I so desperately craved. I took a pretty simple approach and used a bag of pre mix Banh Xeo batter and for a first go I was pretty happy with my efforts. Quan Viet is a lovely and very friendly little restaurant on a local suburban shopping strip that you wouldn't expect to house a little gem like Quan Viet. This is the case for many of the great little local restaurants that Lauren has located and certainly makes me stop and look a bit harder every time I pass a quiet little suburban shopping strip. (Sweet Rice in Altona also comes to mind, but that's another obsession for another time). The Quan Viet Banh Khot are really something special and definitely worth the drive to Braybrook. The even better news is that Quan Viet also have lots of other fantastic dishes on offer, not least of which is their awesome custard apple smoothies (again, another obsession was triggered). 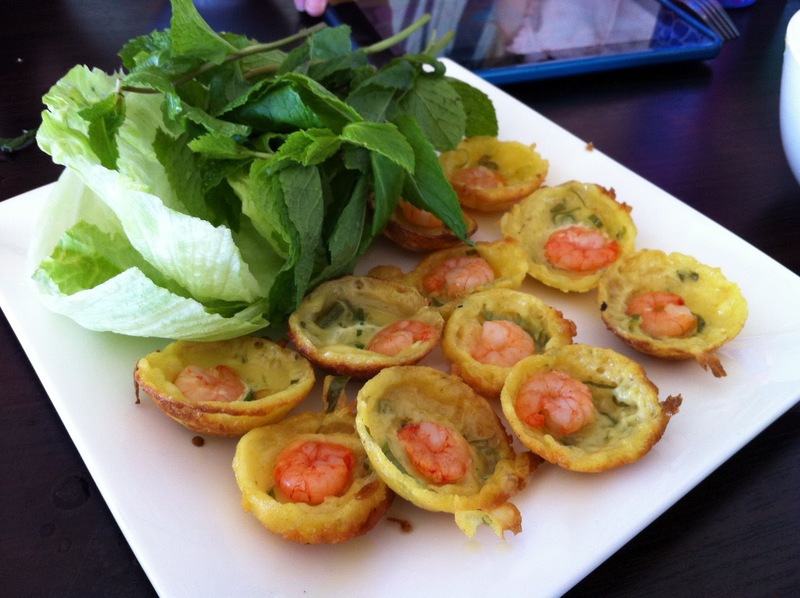 One of the other dishes worth travelling west for is the Banh Xeo. Yes I know what you're saying, you can get that in Footscray, Richmond, the city etc. The thing is, Quan Viet's version is really quite different from what you get in the places I just listed. I have a suspicion that Quan Viet is more of a regional specific restaurant, they also serve another very obscure rice paper roll dish called Nem Cuon Nha Trang so that makes me think their dishes have a Nha Trang regional spin. 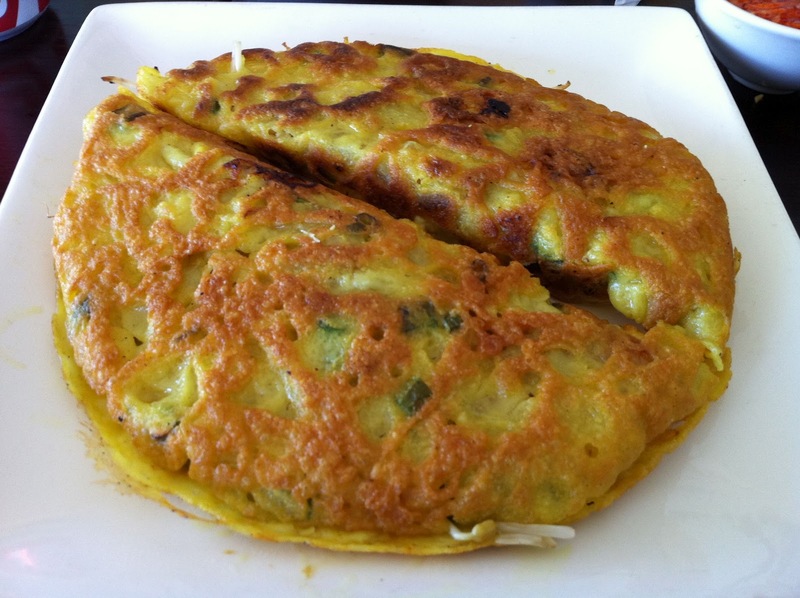 The Banh Xeo is not huge like a lot of other places but you get two pancakes and they are a lot fatter than most. More interestingly the batter is crispy and crunchy but with a wonderful chewiness that I have never experienced before. They don't peel the prawns either which can be confronting for some but I reckon it adds a nice extra texture to the dish. Both dishes come with one of the more generous plates piled with mint and lettuce and the Nuoc Cham is also pretty special. Quan Viet was our go to Vietnamese restaurant for a long time and every so often we get an itch for Banh Khot that can only be scratched by a drive to Quan Viet in Braybrook. Great place! I had Viet-style Hainan chicken rice there yesterday and it was good. Not always an advisable menu choice in a non-Malaysian place but it worked this time. Nice vibe at this joint! I definitely need to give that a go next time we visit. It's interesting how pervasive such a simple boiled chicken and rice dish has become. I have read that it originated from Hainan Island off the coast of China yet there is a Vietnamese version (Com Ga Hoi An) and also a Thai version (Khao Mun Gai) yet the version Malaysian Hainanese Chicken version is the most well known. Sometimes the simple dishes are the most popular!